Three European champions, two past winners and one incumbent holder of the title, entered the arena as play commenced in the opening round of the Men’s Singles event at the Seamaster 2018 ITTF World Tour Asarel Bulgaria Open in Panagyurishte. It was for all three success but for the most successful of the trio, the three times champion, it was hard fought success and one that spoilt a celebration. Vladimir Samsonov of Belarus, the no.10 seed, beat Chinese Taipei’s Lin Yun-Ju in seven games (11-4, 7-11, 11-7, 8-11, 11-9, 8-11, 11-7) and thus deprived the young man of what would have been a memorable birthday present. On Friday 17th August, Lin Yun-Ju will celebrate his 17th birthday, now with a little poetic licence and time difference with Chinese Taipei taken into consideration, for his family back home it would just about be his birthday. Maybe with age the memory is failing 42 year old Vladimir Samsonov, the first ever event to be held in the stadium was the 2015 ITTF World Tour Bulgaria Open! Success for Vladimir Samsonov, there was also success for Frenchman Emmanuel Lebesson, the reigning European champion; similarly, he faced an aspiring young player, Aliaksandr Khanin, like Vladimir Samsonov from Belarus. Impressively the fast attacking skills of Emmanuel Lebesson prevailed in five games (11-7, 10-12, 11-5, 12-10, 11-2). Notable wins, earlier for the twice European champion it had been the same against an adversary who was no stranger; Dimitrij Ovtcharov, the top seed, accounted for England’s Paul Drinkhall (11-9, 8-11, 11-6, 11-7, 11-8). Wins as seeding predicted, as play progressed in the top half of the Men’s Singles draw. 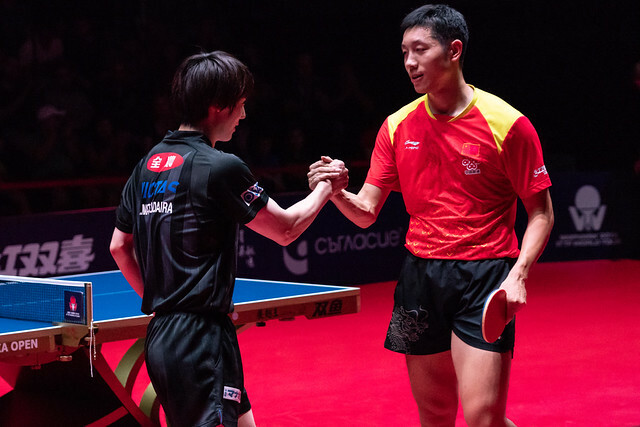 It was the same for Japan’s Tomokazu Harimoto and Kenta Matsudaira; Tomokazu Harimoto, the no.4 seed, beat Korea Republic’s Baek Hogyun (11-9, 11-6, 11-7, 11-7), Kenta Matsudaira, the no.7 seed, overcame Slovenia’s Bojan Tokic (11-4, 11-7, 11-4, 11-8). Meanwhile, Chinese Taipei’s Chuang Chih-Yuan overcame Darko Jorgic, like Bojan Tokic from Slovenia (5-11, 5-11, 11-7, 11-7, 8-11, 11-6, 11-4) but for colleague, Liao Cheng-Ting, the no.15 seed, there was defeat, he was beaten by China’s Zheng Peifeng (11-9, 11-7, 11-8, 11-3) in what was to prove the only upset in the top half of the opening round Men’s Singles draw. The lower half will be completed later in the day.